I am a big fan of food in a pouch for kids. My son loves to be able to hold what he is eating and since hes a wild boy its easier to have his fruit be blended. Buddy Fruits are super easy to take on the go. He drinks them down and loves them. He loves fruit thankfully and these are perfect for him. I place a few of them in our on the go cooler for him on these really hot summer days. We recently tried the fruit snacks. He liked them but I had to of course break them up into tiny pieces for him. I ate the majority of the fruit snacks since they were really good! Soon they will be introducing fruit and milk pouch smoothies. I am sure my little guy will love them! 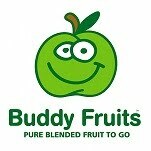 Win a box of Buddy Fruit Pouches and Fruit Snacks like I reviewed. What is yours or your kids favorite fruit? *Limited to US residents; 18 years old and above. Giveaway starts June 22, 2011 and ends on July 3, 2011 at midnight PST. Winner will be emailed and has 48 hours to respond before another winner is selected. I was not paid for this giveaway or post. I was provided for free the product mentioned for this review. The opinions are 100% mine and may vary from others. I love pineapple and you have to try really hard to find a fruit my kids dont like cuz they love it all! My little guy loves any kind of berries, especially blueberries!